Students in Leeds have been tapping into their creative sides to produce education films and podcasts to help promote road safety. Four groups of Year 7 and Year 8 pupils took part in the project, run by Leeds City Council’s influencing travel behaviour team in conjunction with The Riot Act – a theatre-in-education company. The brief was to create content to help children who are about to move up to secondary school stay safe on the roads, by tackling issues that are relevant to all road-users. 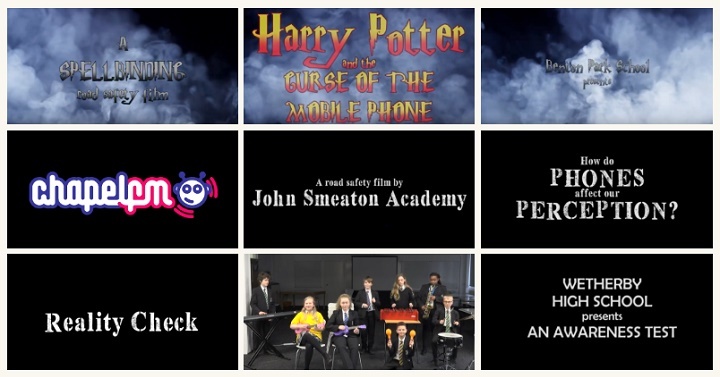 Students from Benton Park chose a ‘wizarding’ theme complete with cloaks and broomsticks – while those from John Smeaton Academy investigated the effect of mobile phones on ‘perception’. Wetherby High School opted for a musical awareness test to highlight so-called ‘inattention blindness’ and Chapel FM Arts Centre recorded a fun three-part radio podcast with a quiz and challenge. Cllr Richard Lewis, executive member for regeneration, planning and transport, Leeds City Council, said: “We know that this age group is more at risk of getting injured as pedestrians than any other as they start to travel more independently. The project was backed by Mark Burns-Williamson, police and crime commissioner for West Yorkshire, who provided financial support through the Safer Communities Fund. Mark Burns-Williamson said: “Who better to get road safety messages to young people than young people themselves?